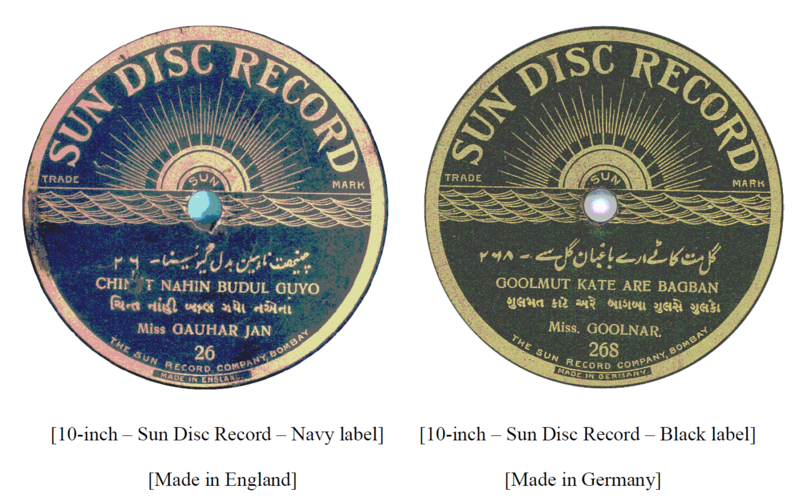 The SUN DISC RECORD was introduced in India in 1909 by F,B, Thanewalla and Co., of 143 Kalbadevi Road, Bombay, and 13 Esplanade East, Calcutta, as an additional product to market in support of the trade in cycles that this firm had been engaged in for a few years. F.B. Thanewalla (or Thanawale) and Co., had been in business as a Sports Outfitter and bicycle merchants for some years commencing business at 135 Kalbadevi Road, Bombay, and soon after expanded the business by opening a branch of the firm at 13 Esplanade East, Calcutta. The increasing popularity of ‘talking machines’ and disc records in India would no doubt have encouraged F.B. Thanewalla and Co., to take on these products as a side-line to their main business in sports goods and bicycles as a boost to their turn-over and profit. Apart from musical instrument dealers who were the main outlet for the products of the sound recording industry, the ‘second front’ of the industry in India was to open up dealerships with such businesses as sports outfitters and ‘cycle’ traders. Bhajans, Ramayan, Narsi Mehta’s Hindu Prabhati, Jai Stavan’s Parsi’s and Hindu’s Marriage Songs, Famous Urdu and Drama’s, Kachchi and Sindhu Kafi’s. Calcutta’s Famous Singer Miss Gauhar Jan’s Ustadi Songs. THE SUN RECORD CO., Kalbadevi Road, Bombay. These two songs had been recorded by Miss Gauhar Jan for The Gramophone & Typewriter, Ltd., in late 1903, and possibly also for other record companies as well. When introduced the SUN DISC RECORD appears to have been the first Double-sided disc record to be retailed in India for 2 rupees, when all other makes on the market were on sale to the public for 3 rupees or more for the 10″ inch size. In March 1908, The Talking Machine and Indian Record Co., Fort, Bombay, had advertised that the PHON-0-PHONE Indian Disc Record was shortly to be marketed at ‘popular prices’ but to date it has not been verified that the PHON-0-PHONE disc record (single side or double sided) was in fact placed on the market and all pressings of this label that have been found are manufactured by The Viel-o-phone Co., Ltd., which did not commence disc pressing in India until 1914, at Mahim, Bombay. The label of the SUN DISC RECORD features a ‘corona’ (sun emerging over the horizon) which as a disc record was a registered ‘design’ or ‘trade mark’ of Polyphon Musikwerke, A.G., Bahnofstrasse-61, Wahren-Leipzig, in Germany. The Polyphon Musikwerke, A.G., Wahren-Leipzig, had been established in about 1890 by Gustave Brachhausen and Paul Reissner, and within a short time became one of the most important manufacturers of disc musical boxes in the world. In about 1903-04, Polyphon Musikwerke, A.G., is believed to have attempted to enter the ‘talking machine’ and disc record industry in association with Nicole Freres, Ltd., of London, who had entered the disc record manufacturing industry with a celluloid coated cardboard disc record in August 1903. The known examples of this type of disc record are very few and were described as POLYPHON – Schallplatte. This attempt to enter the disc record industry appears to have been a failure, which led Polyphon Musikwerke, A.G., to enter the ‘talking machine’ and disc record industry as a manufacturer in their own right utilizing their factory at Wahren-Leipzig. In about 1906-06, the Polyphon Musikwerke, A.G., introduced disc records of the ‘shellac’ type with the ‘trade mark’ POLYPHON RECORD, and the anonymously described ‘corona’ or ‘korona’ label as described above. I have not been able to ascertain when the ‘corona’ label first appeared in Germany but it is known that some titles were also manufactured with the POLYPHON RECORD label and that the ‘corona’ label was certainly on the market in Germany by mid 1909. Taking the above information into consideration and that the first advertisement for the ‘corona• labelled disc records under the name of SUN DISC RECORD were brought out in October 1909, it would be reasonable to assume that the recordings of the Indian repertoire were taken in late 1907 or 1908, with Bombay and Calcutta being the only locations of the recording sessions. The SUN DISC RECORD seems to have been allocated a system of continuous numbering from No. l up and not sub-divided into ‘blocks’ for different types of performance. The catalogue number and the matrix number are identical with the matrix number being hand written underneath the paper label and the same number being an embossment between the last groove of the recording and the label edge. Occasionally the matrix numbers have a dot[,] following the number while other have a hyphen[-] before the number but more often than not the matrix number has no other suffix or prefix indication. All pressings that have been e􀂫amined have a raised outer ring at the edge of the disc and most pressings have a smaller ring containing the label data, but curiously, it is more common to find the disc pressings with the off-centre labels without the inner ring. Apart from the information that the discs were either manufactured in Germany or England, the different types of pressings suggest that more than one manufacturer was involved with the pressing of the SUN DISC RECORD. At this stage of research the lowest known number is 25 (a recording by Hiss Gauhar Jan) and the highest being 989 (a recording by Miss Goolnar), and of almost one thousand possible recordings within this range – the details of about three hundred are known, of which the majority are of Bombay recordings. The roster of artists and repertoire of songs on the SUN DISC RECORD label bears a close resemblance to the RAMA-GRAPH DISC RECORD (which had been on the market in India since September 1907, through T.S. 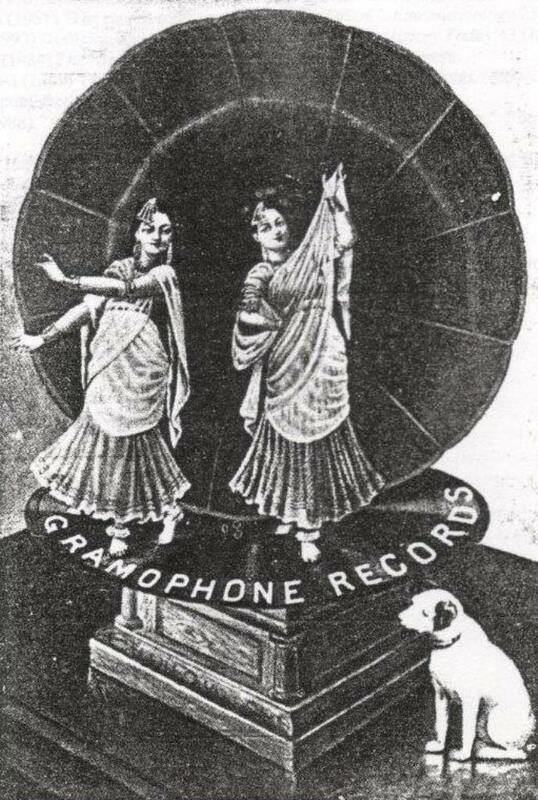 Ramchunder and Bros., Bombay), and to the ZONOPHONE RECORD, the Indian repertoire of which was introduced by The Gramophone Co., in September 1910. There are two known varieties of the SUN DISC RECORD – the more common is a black coloured label with gold printing – Hade in Germany, while the other is a plum coloured label of the same design also with gold printing, but – Made in England. A curious feature with both label types – black or plum coloured is that many discs are found with the labels quite off centre – whether this was a manufacturing problem or simply carelessness is not known but of all record labels of Indian record labels this aspect of the labels being off centre is more common with the SUN DISC RECORD than any other label. Several copies of SUN DISC RECORD’S also appear to have printed labels pasted over the original label – which appears to have been buffed off, This may have been due to the wrong labels having been given in the first pressing – and simply relabelled. Another feature about the SUN DISC RECORD is the details given on the printed label. Most pressings that have been examined have the artists name in English, while the song or tune titles is given in English, Gujarati and Urdu (Hindustani) script – and with the record number printed in Arabic numerals – as well as English numbers. While it may be presumed that the German pressings were manufactured by Polyphon Musikwerke, A.G., at Wahren-Leipzig, the identity of the English Manufacturer is not known, although the type-face of the embossed letters seems to indicate that the ‘Made in England’ pressings are the product of The Disc Record Co., Ltd., of Stockport, near Manchester, England. It is known that The Disc Record Co., Ltd., had formerly been manufacturing the NICOLE RECORD for Nicole Freres (India) Ltd., of the red celluloid coated cardboard Lype, arid that by 1909 the same company had been furnishing the ‘shellac’ type of pressings for a few clients in Sweden, France and England, so there is no reason why the company could not offer similar pressings for clients in India. It is possible that The Disc Record Co.,Ltd., had used the former NICOLE RECORD matrix stocks for pressing the SUN DISC RECORD – but have obscured the original identity of the ‘Nicole’ matrix by erasing the ‘Nicole’ markings – a11d making new copy stampers for the SUN DISC RECORD. For the majority of SUN DISC RECORD’S it is believed that they are original issues for the label. Between 1909 and 1912 numerous advertisements have been found in a variety of newspapers, mainly in the Gujarati language such as The Bombay Samachar and Jam-e-Jamshed, and although most of these advertisements ran for several months without change, record numbers or details of the releases were not usually given – in any language. Over a span of about four years the advertisements only varied in that the name of F.B. Thanewale and Co., Bombay, changed to The Sun Record Co., Bombay, and by November 1912, the address of F.B. Thanewale and Co., and The Sun Record Co., had changed from 143 Kalbadevi Road, to 135 Kalbadevi Road, but by the end of 1912 – no further advertisements appear to have been placed in the major vernacular newspapers of Bombay. 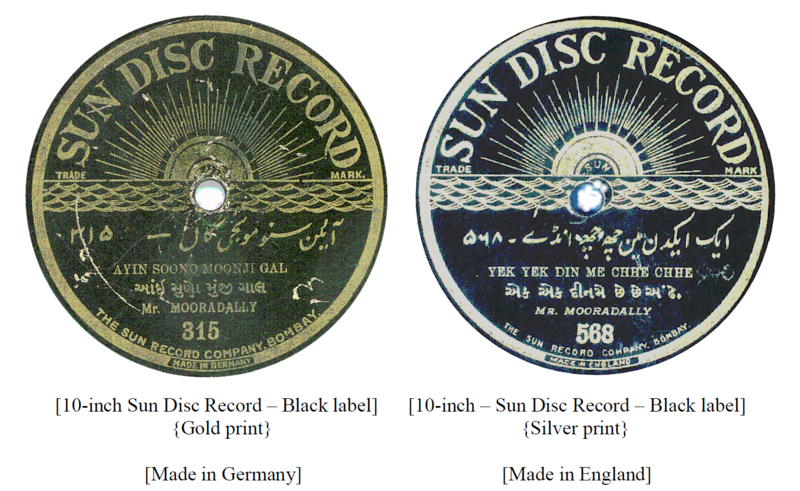 Apart from the change of address, the only other relevant piece of information given in the advertisements was that the price of the SUN DISC RECORD had been reduced in September 1912 from 2 rupees per (double-sided) or “both side songs” per disc down to l rupee and 8 annas, a reduction of 25% on the price that had been constant since October 1909. The advertisements never mentioned any other size disc record other than the 10″ – and thus far no SUN DISC RECORD has been found or traced in any other size, which suggests that the SUN DISC RECORD was only ever made in the 10″ inch size. While on a business tour of Europe and the United States in 1914, Valabhdas Runchordas had reported in several interviews that The Sun Disc Record Company, had concentrated their efforts in the sound recording industry by selecting the best selling titles of other brands for recording and had captured a substantial share of the market by offering these discs at a low price. By 1912 it was possible to find the same song recorded by Mr. Murad Ali, on a variety of labels including – GRAMOPHONE CONCERT RECORD, ZONOPHONE RECORD, BEK.A GRAND RECORD, BEKA RECORD (8″), RAMA-GRAPH DISC RECORD and ODEON RECORD, as well as the SUN DISC RECORD under a variations of his name from Murad, to Mooradally. A similar situation occurs with recordings by Miss Gauhar Jan, so how any member of the record buying public selected their preferred rendition of a song from the several versions offered by a number of record companies is anybody’s guess, except that with the SUN DISC RECORD version it would have been a little cheaper than the other renditions on other labels. 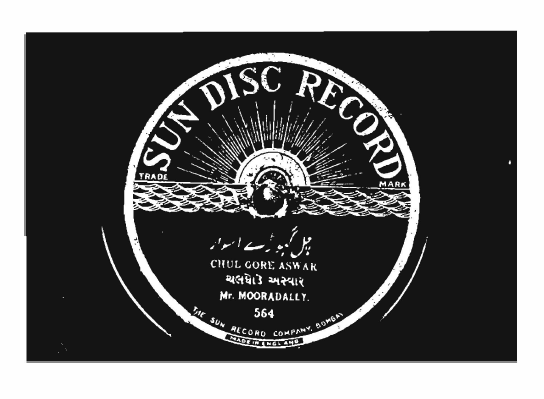 Although the full listing of releases on the SUN DISC RECORD label is not known at present, amongst the most prized by record collectors are the recordings by Bal Gandharva (Narayan Rajahaunsa – born 1888 – died 1968), as the SUN DISC RECORD releases of Bal Gandharva which were most likely issued in about 1911-12, when he was just emerging as one of the future ‘super-stars’ of the Marathi stage, are only pre-dated by his recordings for the BEKA RECORD (8″) and BEKA GRAND RECORD (10″) discs of 1907, and preceed all the recordings that he made for The Gramophone Co., Ltd., in 1913, Some of Bal Gandharva’s recordings for the ZONOPHONE RECORD and HIS MASTER’S VOICE record labels have remained perennially popular – but his recordings for the SUN DISC RECORD label, have been forgotten except for those record collectors lucky enough to have found or preserved copies of these historical recordings. The SUN DISC RECORD marketed by F.B. Thanewale & Co., and The Sun Record Co., Bombay – should NOT be confused with another ‘Sun’ disc record issued under the label style of SUN RECORD COMPANY, COCANADA, (red label) and the SUN TALKIE RECORD by The Sun Record Company, Cocanada. This label was first issued in March 1935, and continued for several years – with most of it’s repertoire being in Telugu and Oriya with an emphasis on sets of discs of Telugu drama, in the NV numerical series, using Gramophone Co., Ltd., matrix stocks. If any member or record collector reading this article has any SUN DISC RECORD (10″) – with either black or plum coloured label – I would be most grateful to receive the information – for although the details of about three hundred releases in the Indian repertoire are known there are still a large number of ‘blank entries’ – about which we do not have the data – so any contribution – direct to the Secretary of the Society of Indian Record Collectors would be most appreciated – with a view to eventually publishing a listing of the Indian repertoire of the – SUN DISC RECORD – so that all might share in the ‘treasure of this label’. This entry was posted in INDIA and tagged Michael Kinnear - Discographer, Michael Kinnear- Researcher, Polyphon Record, Rama-Graph Disc Record, Sun Disc Record, The Sun Record Co. Bombay, The Zonophone Record by bajakhana. Bookmark the permalink.